Financial incentives are available from local, state and federal governments to harness solar energy. 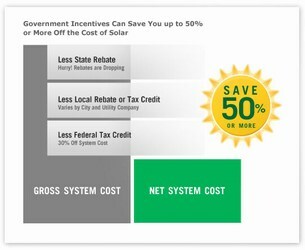 These incentives dramatically reduce the net cost of a solar system and make it very affordable. The payoff is within 2-8 years. These incentives make solar power less expensive than utility electricity. California leads the nation in solar rebates. There are two types of rebates for homeowners. For new homes, New Solar Home Partnership (NSHP) administers the solar rebates. The rebate is determined by the expected life-time production (Kwh) and the current rebate level. As of Jan 2011, NSHP rebate is at Level 1 which comes to $2.50/Watt. Note that California Energy Commission (CEC) has directed NSHP to keep the rebate at level 1 even though the target goal was achieved. This is to encourage solar panels on new construction. The federal government allows you to deduct your system costs off your federal taxes. If the federal tax credit exceeds tax liability, the excess amount may be carried forward to the succeeding taxable year. This credit is available at the time of filing your tax returns in the year you installed the system. Assuming a 30% taxation bracket, you can save upto 30% off the system cost.